This Polish recipe for sorrel soup or zupa szczawiowa (ZOO-pah shchtah-vee-YOH-vah) can be made in many different ways. This is just one variation. Sorrel is high in vitamin A and contains some calcium, phosphorus, potassium, magnesium and vitamin C.
In a large saucepan or Dutch oven, place 6 cups cold water, carrots, and parsley and bring to a boil. Add bay leaf, potatoes, and bouillon cube and bring back to a boil, reduce heat, and simmer until vegetables are tender. In a large skillet, melt butter and sauté sorrel for 10 minutes. Transfer to the soup and bring to a boil. Reduce heat. Remove bay leaf. In a heatproof bowl or measuring cup, fork-blend sour cream with flour and temper with a few ladles of hot soup, whisking constantly until smooth. Transfer tempered sour cream-flour mixture to soup, stir well, and simmer until thickened and just under the boiling point. Adjust seasonings. Portion soup into heated bowls and garnish with chopped dill or parsley and egg quarters. 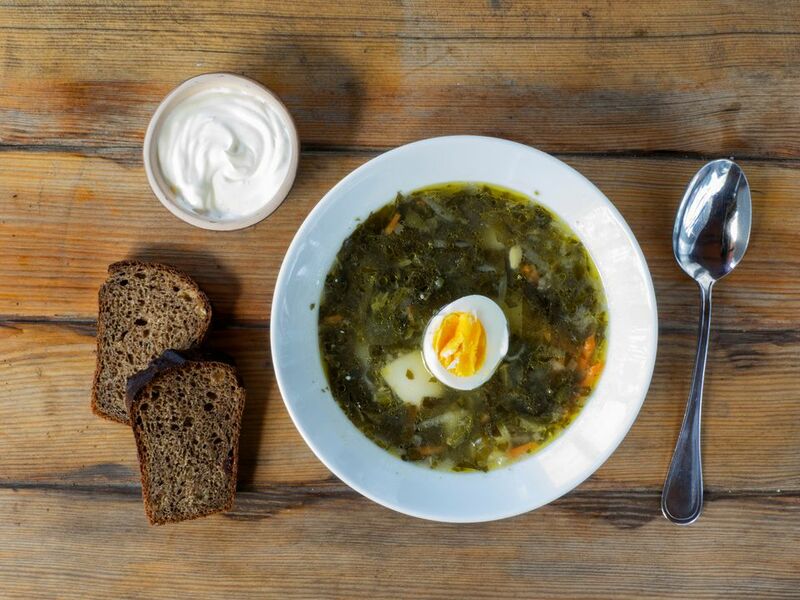 In Russia and Ukraine, sorrel soup is known as shchavelya sup, but is more commonly just called schav. This recipe for schav borscht is a Jewish version which can be eaten hot or cold, and it's a good candidate for Passover. Polish spring beet soup is known as botwinka. It is made with young, spring beets and their green tops that have a spinach-kale flavor. In addition to being a taste sensation, the soup is packed with antioxidants along with vitamins A and C.
How Do You Make Polish Beet Soup in a Snap?